Bishoy Armia Boulous, 31, formally known by his Muslim name, Mohammed Hegazy, was arrested Wednesday morning (Dec. 4) at a cafe in the city of Minya, 260 kilometers (161 miles) south of Cairo, and is likely being tortured, sources said. Security forces said he had a camera and four flash drives when they arrested him and claimed he was working for The Way TV, a Coptic Christian-owned, U.S.-based religious television channel that broadcasts into Egypt via satellite. 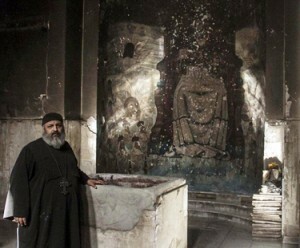 Security forces claimed that Boulous was contributing to a “false image” that there is violence against Christians in Minya. Those familiar with Boulous said his arrest had nothing to do with any reporting work but constituted retaliation for becoming a Christian. “The police have made it seem like they are arresting him for different reasons other than him being a convert from Islam,” said Mamdouh Nakhla, chairman of the Kalema Organization for Human Rights. Boulous gained fame, and many would say infamy, across Egypt when he decided in August 2007 to file a legal case to have his religion and name changed on his government-issued identification card. In a country where 84 percent of Egyptian Muslims polled in 2010 said the state should execute those who leave Islam, Boulous became an extremely controversial figure, and his face was plastered on newspapers and magazines across the country. According to a statement by the head of the Minya police to Egyptian media, Boulous is imprisoned pending an investigation into charges of inciting violence. Several Egyptian newspapers have reported that he is also being investigated for espionage. Advocacy organization United Copts has claimed he is being investigated for evangelism, but “proselytism” is not officially a crime in Egypt, although it is heavily frowned upon. Human rights activists said they fear for Boulous’ safety. Minya, both the city and the province, since August alone has been the site of numerous attacks on Christians, church buildings and Christian-owned properties, all well-documented by journalists, domestic non-profit organizations and international human rights groups. “The persecution is very obvious, and everybody’s looking at it,” said Joseph Nasrallah, head of The Way TV. But Nasrallah told Morning Star News that Boulous, who has worked as a journalist, approached The Way TV seeking employment. Nasrallah said he told Boulous he would consider hiring him but hadn’t done so. “He offered to work, but I said to him, ‘Let me get back to you. I will consider that,’” he said. Nasrallah said he was helping Boulous financially and has secured a lawyer to assist him. “He was not working for The Way TV, but we will never forsake him,” he said. Boulous was in Minya with a reporter, Nasrallah said, but he did not confirm whether the reporter was working for his television channel. It is possible that Boulous was in Minya collecting information on his own for “The Way TV” to prove his value to them. It is also possible that Boulous either misunderstood or misrepresented his relationship with “The Way TV” to Egyptian authorities. Egyptian authorities may also have misunderstood or could be purposely misleading the public about Boulous and his status as a reporter. Boulous became a Christian in 1998. After his conversion he was arrested several times by the former State Security Investigations Service (SSI). Boulous was tortured by SSI agents for three days during one of his stints in jail, he told Compass Direct News in 2010. Still, he refused to recant his faith in Christ. Boulous said the main reason he filed the suit was to protect his children from the same persecution he suffered for becoming a Christian. After filing suit, he was forced into hiding when threats against his life and attacks became overwhelming. In one incident, for several days extremists surrounded a home where Boulous was no longer living. In another, a group of men broke into Boulous’ apartment, rifled through it and set it on fire while he was away. According to Nakhla, Boulous’ wife, also a convert from Islam, and their two children are living in an undisclosed country in Europe. Religious freedom is guaranteed under Egyptian law but limited by various interpretations of sharia (Islamic law), which under the past two constitutions trumps national law. While it is easy and even encouraged for someone in Egypt to convert to Islam, it is impossible for a Muslim to legally convert to Christianity. Boulous was the first convert in Egypt to file suit to change his legal religious identity. In January 2008, a court ruled against him on the grounds that sharia forbids conversion away from Islam. “The court also stated that such conversion would constitute a disparagement of the official state religion and an enticement for other Muslims to convert,” according to a report issued by the U.S. Commission on International Religious Freedom. In April 2010, an appeals court suspended the case indefinitely, while it waited for the country’s constitutional court to rule on a previous case dealing with religious identity. Before those cases could be resolved, the 2011 revolution happened and the constitution was rewritten. Following the ouster of the Muslim Brotherhood-led government in July, another constitutional revision is underway. We love brother Bishoy. He, as every strong believer, is standing for what he believes in. God showed him the Light in Jesus Christ. I feel sorry for those torturing him??! Instead of torturing just openly pray to God, the loving Creator to show you the truth. Somebody that cares for everybody.